You know you have some days where everything seems to go wrong. 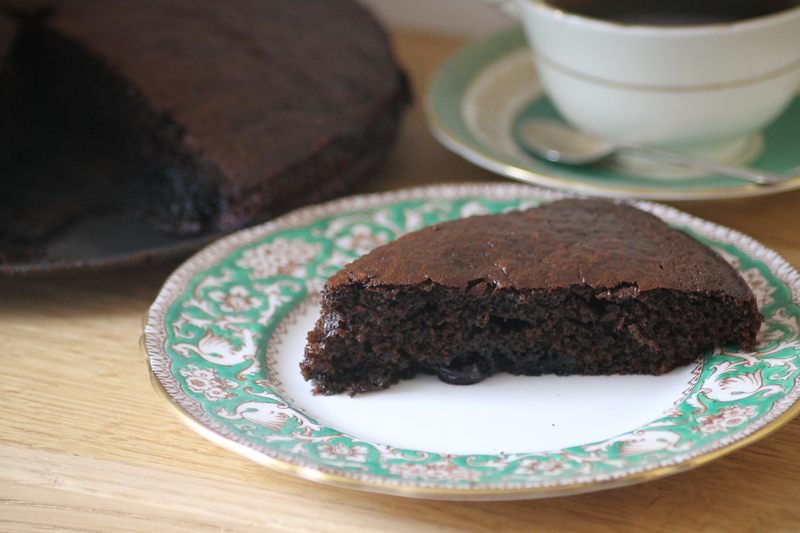 Today was one of those days until I sat down with a cup of tea and a piece of this ‘Blackstrap molasses & blueberry cake’. Even whilst I was making it things weren’t going well: the kitchen scales broke, my daughter woke up early from her nap and without realising I had trampled sticky molasses all over the kitchen floor! But believe me it was all worth it once I stuck into a piece of this dark bittersweet cake…I even helped myself to second slice and didn’t even have to feel guilty about it, as far as cakes go it’s pretty healthy. It contains no refined sugar, only blackstrap molasses a by-product of the sugar making process. I bought some blackstrap molasses from a health food shop after researching alternative sweeteners and their health benefits. Although it’s not a widely used ingredient I eventually came across this recipe on Heidi Swanson’s recipe journal ‘101 cookbooks’ and inspired me to give it a try. I’m not saying this is a cake made for babies but if your children are anything like mine they will want to try everything you eat, so I wouldn’t feel too bad eating this in front of them. Preheat your oven to 180 ºC and butter a 22cm round cake tin. In a large bowl mix the dry ingredients: the flour, baking powder, bicarbonate of soda and salt. Measure out the molasses in a separate bowl and whisk with 2 tablespoons of the milk. In yet another bowl whisk together the cider vinegar with 3 tablespoons of the milk. Mix the cider vinegar mixture into the molasses mixture, then whisk in the eggs. Pour the molasses mixture over the flour mixture and stir until combined. Stir in the butter. Toss the blueberries with 1 teaspoon of flour and fold them into the batter. Pour the batter into the prepared pan and bake for about thirty minutes or until a skewer comes out clean. Let cool for a few minutes and then serve.